What is track my arrival? 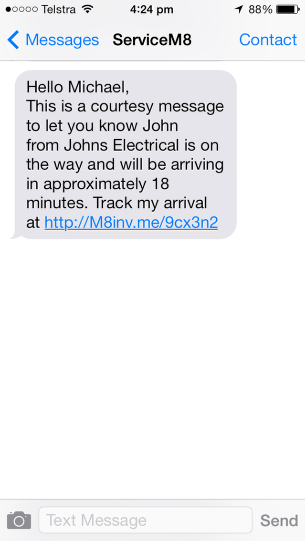 We've always had the option to SMS the customer with your ETA when arriving at jobs sites, this add-on allows you to go a step further and give customers a live-view as you travel to their job site. The feed is only available to customers while your on-route and deactivates shortly after. Great for emergency type jobs where the client is stranded waiting for your arrival. 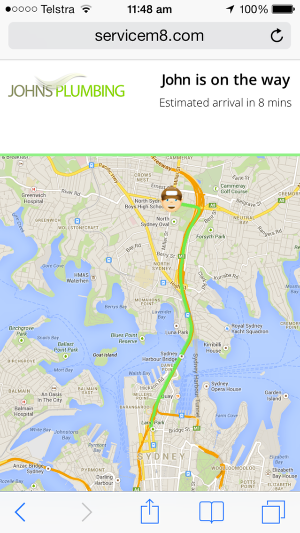 How do you use Track My Arrival? Once activated, Track My Arrival will just start to work. When ServiceM8 has a GPS location of the iPhone at the time of sending the notify SMS a special link will be added to the end of the SMS. Why is one of my staff members icon gray instead of coloured?